On Wednesday, Tennessee’s men’s basketball team was picked to finish second in the SEC for the upcoming 2018-19 season. That’s a far cry from being picked second-to-last before the start of last season, but there may still be a chip on UT’s shoulder. Despite returning their top six players and the SEC Coach of the Year, the Vols still weren’t picked to finish atop the conference. Kentucky was voted as the favorite to win the regular season title for the 14th time in the last 21 years during SEC Media Day, and one current SEC head coach disagrees with the media’s decision. Ben Howland, the head coach of Mississippi State, spoke with the media during Wednesday’s event, and he believes the Vols are the top team in the SEC, not Kentucky. The Vols won a share of the SEC regular season title last year, splitting the regular season crown with Auburn. Tennessee finished last year with a 26-9 overall record and 13-5 SEC record, played Kentucky in the SEC Tournament Finals, and earned a No. 3 seed in the NCAA Tournament. 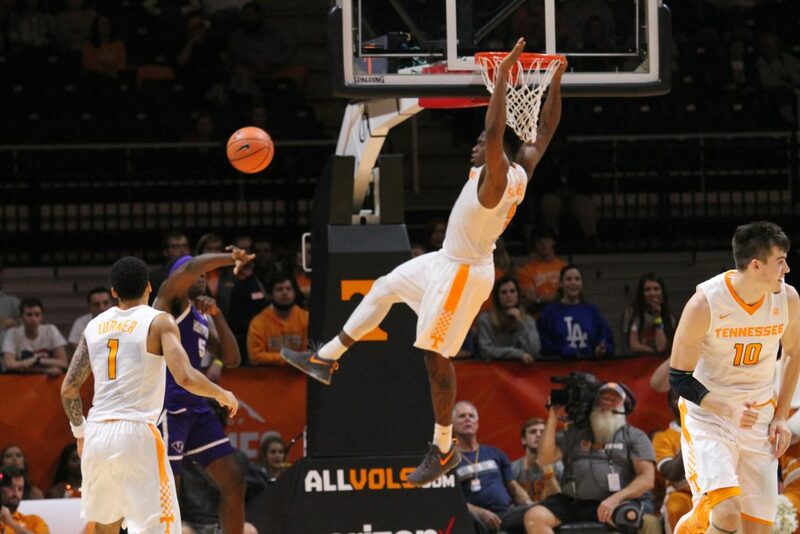 The Vols return all five starters from last year’s team including reigning SEC Player of the Year Grant Williams and All-SEC performer Admiral Schofield. Tennessee also returns almost all their bench production, and that includes reigning Co-SEC Sixth Man of the Year Lamonte Turner. Kentucky, like usual, has a lot of highly-rated newcomers making their debut next season. According to 247Sports, the Wildcats had the No. 2 signing class in the 2018 cycle, hauling in five of the top 40 overall players in the class. Kentucky also welcomes in Reid Travis as a grad transfer. Travis was a two-time First Team All-Pac 12 power forward for Stanford and was immediately voted as a First Team All-SEC player at Media Day. Last season, Tennessee swept Kentucky in the regular season for the first time since 1998-99. Kentucky did get the last laugh against the Vols, however, defeating them in the SEC Tournament Finals, 77-72. But the Vols have won three of the last five and four of the last seven games they’ve played against Kentucky. Ben Howland was hired on as Mississippi State’s head coach the same offseason as Rick Barnes was hired at Tennessee. Howland has gone 55-45 with the Bulldogs in three seasons, and last year was his best with Mississippi State. He led the Bulldogs to a 25-12 overall record and an appearance in the NIT Tournament semifinals. The Vols will begin their 2018-19 season on November 6th when they host head coach Rick Barnes’ alma mater, Lenoir-Rhyne. Tennessee’s first match-up with Kentucky this season will come on February 16th, and it will be in Lexington. The Vols will host the Wildcats in Knoxville on March 2nd.